Unless we are moving to Iowa, what good is a snowstorm for these 2. Wait, there's a snowstorm there? LOL. DAMMIT. Well, we would be able to trust the QB on the road, I guess? I heard they have attendance issues and if they don't turn it around then they'll have to move to Canada. If one of you guys could Tweet me or send me a message on here when this game starts, I'd really appreciate it. I don't want to miss it. Geno looked for the wheel route at the end of the first drive, but Bailey knocked Woods off his route by accident. Nassib had a rifle pass a moment ago. WVU running the don't let our legit QB pass offense thus far. Bold strategy. Once the field is covered in snow, you have my permission to score. So...... This is not what I was hoping for. 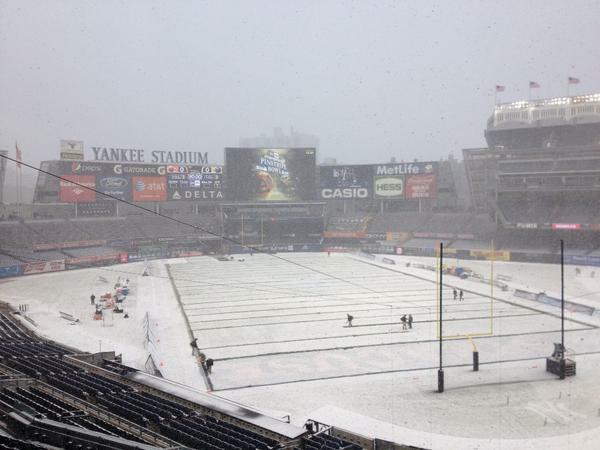 For a guy in Geno Smith who has likely never played in the snow like that before, it wasn't that bad of a performance. He made some gaffs, but there was nothing there that stood out as incredibly bad aside from maybe the first safety. I missed what happened on the fumble that came after Nassib's pick, so I don't know exactly what happened there. Nassib, for a guy who should have been somewhat used to the elements, seeing as he has spent the past 4 winters in Syracuse, looked terrible against a really bad WVU defense. There were several head scratcher throws that I saw. He probably should have had three picks on the day. I could have missed some things and I will look at everything again. That's just the first impression I came away with. And yes, I know Syracuse plays in a dome.